3 July at 10:00 AM, at Casa Santa Marta in the Vatican, Pope Francis met with His Beatitude Sviatoslav. The meeting was held at the request of the Head of UGCC, on the occasion of the celebration of the 1030th anniversary of the Baptism of Rus’-Ukraine. His Beatitude Sviatoslav has told the Pope that the road travelled by the UGCC was a path of martyrdom, a “testimony of the unity that Christ’s Church enjoyed in the First Millennium, at the time of the Baptism of Saint Volodymyr, and a particular witness of martyrs and confessors for Church unity, - in the 20th century.” “Our Church’s path of martyrdom consists in a recognition of the particular mission of the Successors of the Apostle Peter as visible servants of the unity of Christ’s Church,” the Head of the UGCC declared in his conversation with the Holy Father. His Beatitude Sviatoslav once again expressed to the Holy Father the position of the UGCC, regarding the discussions taking place between the Orthodox Churches and the Ecumenical Patriarch, for healing divisions and uniting Ukrainian Orthodoxy: “We look positively upon the efforts to overcome the divisions in Ukrainian Orthodoxy, according to the ancient principal salus animarum lex suprema est (the salvation of souls is the highest law). At the same time, we regard these processes as internal Orthodox matters and, - on no account, - do we ever interfere in them or take part in them. We believe that the civil authority must ensure that conditions exist that allow for the freedom of all churches, in our country. We also believe that is unacceptable for the state, - to treat any Church as an official state church. During the discussion, the Head of the UGCC touched upon the topic of so-called “uniatism.” He recalled that, already in 1993, the UGCC had already undergone the process of reception of the Balamand Agreement. Accordingly, it rejects “uniatism” as a method for achieving the unity of Christ’s Church. “In particular, – he declared, it is obvious that the ultimate act of uniatism, in the 20th century, was the 1946 Lviv pseudo-council. Accusations of uniatism directed at the UGCC, due of its active ecumenical position and its invitation to seek paths of unity with the Orthodox, are nothing less than a manipulation of the facts. The Eastern Catholic Churches, in and of themselves, are not “some sort of method,” but are living members of Christ’s Church, which not only have the right to exist but are also called to engage in mission and in the work of evangelization,” - His Beatitude stressed. Pope Francis, for his part, thanked the Ukrainian Greek-Catholic Church for its martyrdom “as a confession of the Christian Faith and a testimony that the Successor of Peter the Apostle has a special mission of service to Cristian unity.” He assured the UGCC of his support and expressed gratitude for its dynamic development and ecumenical openness. The Holy Father agreed that any accusations of uniatism against the UGCC are absolutely without foundation. He also thanked the UGCC for its active participation in rebuilding Ukrainian society based on the principles of Catholic Social teaching doctrine, while not interfering in the political process. He thanked the Church for its promotion of authentic Christian patriotism which, under no circumstances, should be used or manipulated for particular ecclesiastical or ideological goals. Pope Francis placed great value on the fact that the UGCC had shunned nationalism, and that it condemned xenophobia and racism. The Holy Father also expressed his closeness to the Ukrainian nation which, as the victim of unjust aggression, is living through a painful period of its history. He assured His Beatitude that he constantly thought of and prayed for Ukraine. Pope Francis drew particular attention to the issue of Polish-Ukrainian reconciliation, especially this year when both nations are celebrating the centenary of their restoration of statehood, and the seventy-fifth anniversary of the Volyn Tragedy. 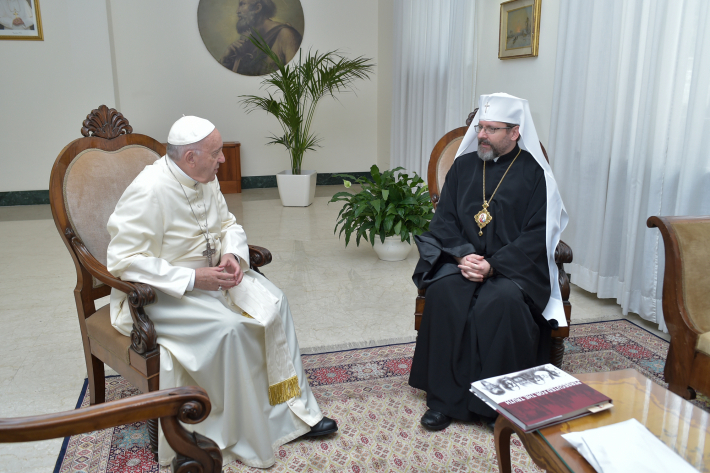 He thanked His Beatitude Sviatoslav for the the book “Dialogue Heals Wounds,” which the Pope considered to be an important step in healing old wounds, - in the relations between the two nations. The Pope supported the idea of the Roman Catholic Church and the Ukrainian Catholic Church, in Poland and Ukraine, issuing a joint pastoral letter, and declaring Pope Saint John Paul II patron saint of Ukrainian-Polish reconciliation. His Beatitude assured the Holy Father that the UGCC will unite itself with him and with all the participants of the joint ecumenical act of prayer for peace in the Middle East, due to take place on 7 July in Bari (southern Italy). The Pope promised that, during this prayer, he will also remember Ukraine. At the conclusion of the audience, the Father and Head of the UGCC presented Pope with the book “Persecuted for the Truth”, published by the Ukrainian Catholic University, and asked for the Apostolic Blessing upon the Ukrainian nation.